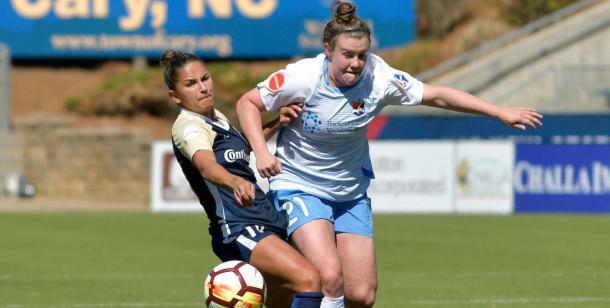 Sky Blue FC is still looking for their first win of the season, but the North Carolina Courage wants to remain unbeaten. 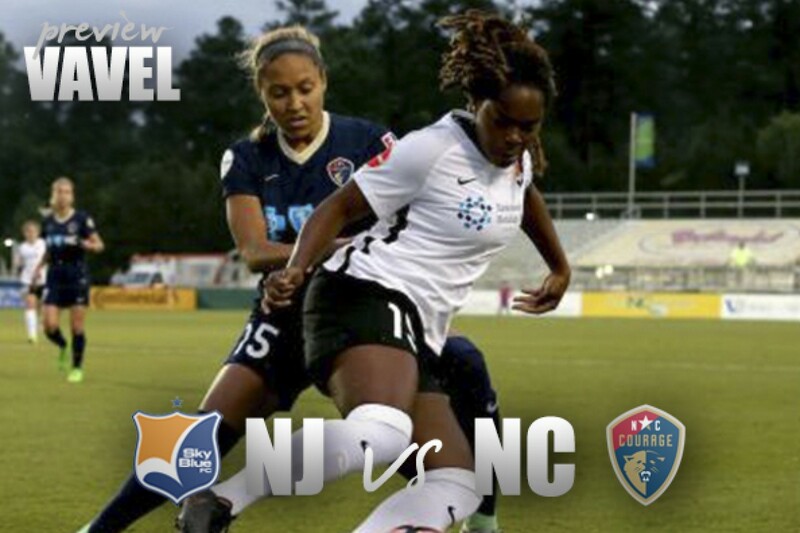 Sky Blue FC looks for their first win of the season when they host North Carolina Courage in week 8. Sky Blue (1 point) is at the bottom of the NWSL standings, whereas the Courage (20 points) are at the top of the league remaining unbeaten thus far. This is the second time these teams have met this season when North Carolina had a late game-winner thanks to Jessica McDonald. The match is set for Saturday, May 20th at Yurcak Field in Piscataway, New Jersey. Kickoff will take place at 7 pm, tickets can be purchased at http://www.skybluefc.com/tickets. It is no secret that Sky Blue has struggled in 2018. They have picked up just one draw in five games. They have problems, but it is not one of a talent shortage. Their attacking talent has the ability to be one of the best in the league, with players like Carli Lloyd, Katie Johnson, Savannah McCaskill, Shea Groom and Janine Beckie. So far the only goal scorers are Johnson and McCaskill. Both have two goals on the season. Providing assists this season are Sarah Killion, Groom, Johnson, and Lloyd. This team is fairly new to each other with 10 returners, so it is easy to recognize that the chemistry is not yet there. However, supporters look forward to when the team will start clicking on all fronts. Sky Blue may be able to score some goals this weekend, North Carolina’s top goalkeeper Sabrina D’Angelo is out with a left ankle sprain. The Courage have signed former Chicago Red Stars back up keeper Michele Dalton in lieu of D’Angelo’s injury. It is likely that Katelyn Rowland will start in addition to the two starts she has on the season. Also injured for the Courage is forward Lynn Williams with a right hamstring strain. Williams has one goal and one assist in seven games played in 2018. It is not likely that the Courage will feel a lack in their offense without Williams. McDonald, McCall Zerboni, and Crystal Dunn all have more goals on the season. Dunn and Zerboni have three goals each, McDonald has two goals and two assists. Finally healthy for the Courage is midfielder Samantha Mewis. Mewis played her first full 90 last week after recovering from a right knee strain throughout this season. Injured for Sky Blue are defenders Christina Gibbons and Rebekah Stott. Gibbons is listed as “out” with a right calf strain. Stott is listed as “questionable” with a right groin strain. Sky Blue will have to fill the holes with their already vulnerable defense. Amandine Pierre-Louis is finally off the injured list. Also ready to fill in is Amanda Frisbie who has finally arrived in New Jersey after being picked up in the Dispersal Draft.